Friday I had one of those awful days of realisation, Mum is not suddenly going to turn up on my doorstep for a cup of tea, nor can I ring her to share something funny. She’s not coming back. I knew grief would be a rollercoaster but Friday started with one of those awful crying sessions, the type where you pull really unattractive faces, your nose runs and you hear seagulls in your head. I needed to let it out, I’ve been strong infront of lots of people and something set me off. Just as I had resigned myself to the fact there wasn’t a lot of point in getting out of bed, there was a knock at the door and the postman was standing with a parcel. As I shut the door I turned the parcel over and read a return label that said “David Parsons“, I knew whatever was in the envelope was going to make me smile as Parsons is one of the nicest guys in the industry. 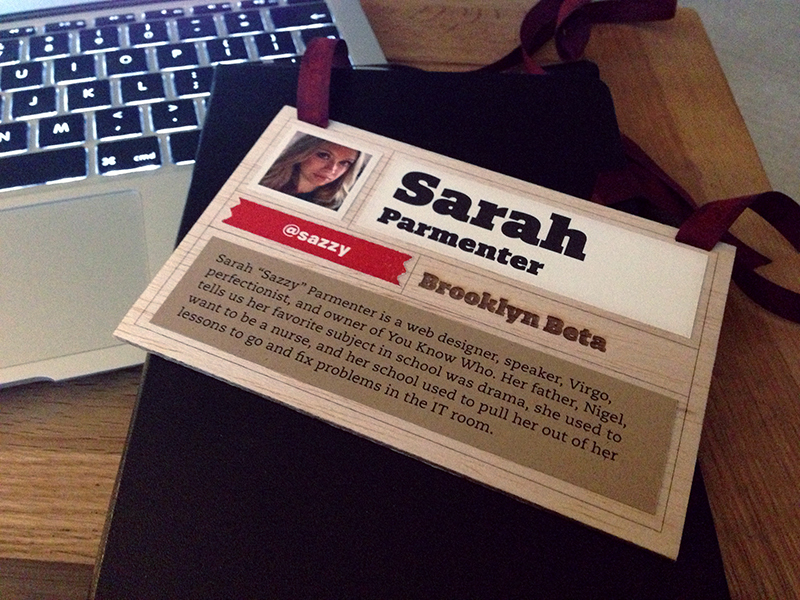 I took it up to my room and unwrapped it on the bed, upon seeing the familiar maroon of the Brooklyn Beta lanyard, I burst into tears. Happy tears. My Dad had told me that was one of the last things him and Mum sat down to complete together, the Sunday before she died on the Wednesday. Brooklyn Beta had asked our parents to give them personal information about us all for our lanyard descriptions, the kind that is hard to find on the internet, and I knew instantly which parts my Mum had helped to complete. I suddenly realised I’d taken the lanyard out of a Moleskine, presuming the Moleskine was there to keep it from breaking, and that I would give it back to Parsons when I saw him at Build – it fell open to a letter he had written and I quickly realised the book was filled with messages from friends and well wishers from Brooklyn Beta. I sat quietly reading each and every message, began to compose myself and instead of feeling down, I felt like I was being caught in the arms of friends, even thousands of miles away. It was quite a surreal experience, one I’ll never forget. I won’t post the messages here, they were intended for my eyes only and I’d like to keep it that way but feeling so much love, warmth and friendship from these friends has certainly got me through some dark days so far and on that day, when I felt like I had nothing to get out of bed for, I realised I had plenty. My friends were there to catch me and take me as they find me, they’re not judging me or rushing me, they’re simply there, like the most beautiful, comforting, security blanket you’ve ever seen. To all those who sent me messages, you know who you are and I thank you from the bottom of my heart. Also, a big thank you to those friends also in the Authentic Jobs network, I’ll never forget what you did for me, you know I’d do it all for you in return, in a heartbeat.